Don't suppose someone might be able to identify this bird call? 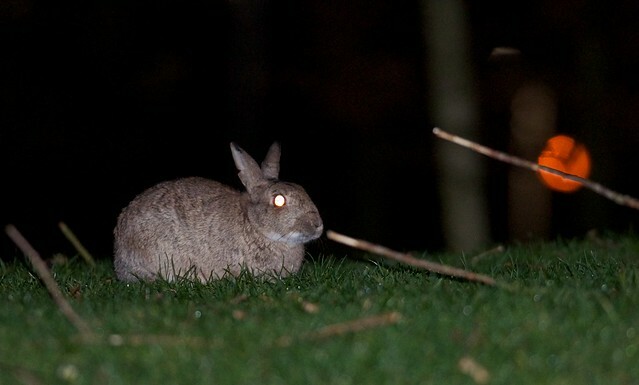 I heard it around 1am, on returning from an hour of surprisingly worthwhile bun photography. I may actually persist with such - I obviously won't be getting especially exciting shots, but these results do suggest that with an IR flood to gain autofocus, I might be able to get some worth keeping. Getting an off-board flash would help considerably - the D90's internal does a decent job, but still quite a bit less powerful than an SB-900. If you were curious as to how trackable RFID devices are, you might try asking Mythbusters. They were preparing to do just that, and arranged a conference call with a Texas Instruments geek or two. Except, when the time for that call arrived, the participants were not as expected.. There's some interesting thinking going on with Fuji's new X-Pro 1. In particular, their color filter caught my eye - rather than the Bayer filter used almost exclusively in digital cameras, arranging photosites as two green, one red, one blue per 2x2 square, they've taken a 6x6 grouping that offers all three photosite colors along vertical and horizontal lines. Full specs here. In a nutshell, it's a MILC, with 16MP APS-C sensor (1.5x crop factor), sensitivity to ISO 6400, expanding to 25600, 3 or 6fps continuous shooting, flash sync to 1/180th. It'll apparently list for around $1700, with lenses for the new X-mount "in the $650 region". GLaDOS writes a letter to Princess Celestia. There's a superb comment, too: "My little portal, I﻿ used to wonder what testing could be. My little portal, until you shared its science with me. Big adventure, tons of fun, companion cubes faithful and strong. Sharing cake, why it's an easy feat, and neurotoxin makes it all complete." Someone went and GLaDOSified that letter and don't forget the Testing is Magic theme song. The autotuned version of the letter definitely works better. As the uploader noted, it had to be done. Haven't you seen this torrent? 8.76GB of pony music, both official and fan-made. It's where I first heard My Little Portal. The Beatle Bronies stuff, while a bit rough in spots, is pretty good, too. If Patrick Stewart does a guest spot on the show, it had better be during an episode where Discord comes back. I rather like these huge torrents. I may not like everything in them, but it gives me a chance to get all the stuff I do like while also discovering new stuff. I can always just go back later and delete anything I dislike. I think such an episode would require a reversal of this image. I'm not overly concerned with wasting space. I still have maybe 150GB free between my two external drives, and I want to add another (probably 2TB) drive to the mix anyway. My concern with that sampler HD release they're doing is that they didn't put Best of Both Worlds Parts 1 & 2 on it. I think that'd be a killer episode to really get people interested in the HD release with. 2) There's a large English-speaking broadcaster not a million miles from here that doesn't depend on advertising revenue from credit card companies. All, of course, Wild-Assed Guesses™, but I imagine Discovery's the 800lb gorilla as far as buyers go - typically, the US TV buyers have the cash, so their concerns would be heard loud and clear, despite the nominal independence of production. (1) To harbor such extraordinary wealth - and the Vatican is quite mind-bogglingly rich - whilst overseeing such poverty seems reprehensible to me. That doesn't apply only to them, of course. (2) To defend their staff against criminal prosecution through what would, in any other circumstances, be racketeering, when faced with the prospect of admitting they employ child rapists, is.. well, let's say "wrong". And not merely on a few isolated incidents, but repeatedly, systematically, and worldwide, from the US to Ireland and beyond. Not to mention their love of fanning homophobia, particularly in the US - two of the major financiers of Prop 8 in California were the Catholic and Mormon churches. I've been to the Vatican and it does seem like a hell of a rich place. They've harvested what's best off the New World for ages, raped, robbed, slaughtered and conquered vasts areas of land and various peoples. And it wasn't until John Paul II became pope when the Vatican issued a mere apology for all the 'misconduct' and persecution that took place ages ago. That comment is a ripoff of another video.